Thanks so much Dotti. It tasted fantastic. And there are still more to eat! Wonderful Sherry … I’ve missed your beautiful blog! Love the use of light and the details you have captured in this image. A great shot to compliment the quote. Mmm-mmm-mmm! That does look good! Fantastic photo, great lighting. Now isn’t that the truth???? The tomatoes were amazing this year. That will guarantee some good eating this winter Kathy! Glad we could share the bounty with you and Stan, Elena! Ida, this is a Black Krim, one of the very tastiest heirloom varieties, in my view. Thanks for visiting. That quote is so true. 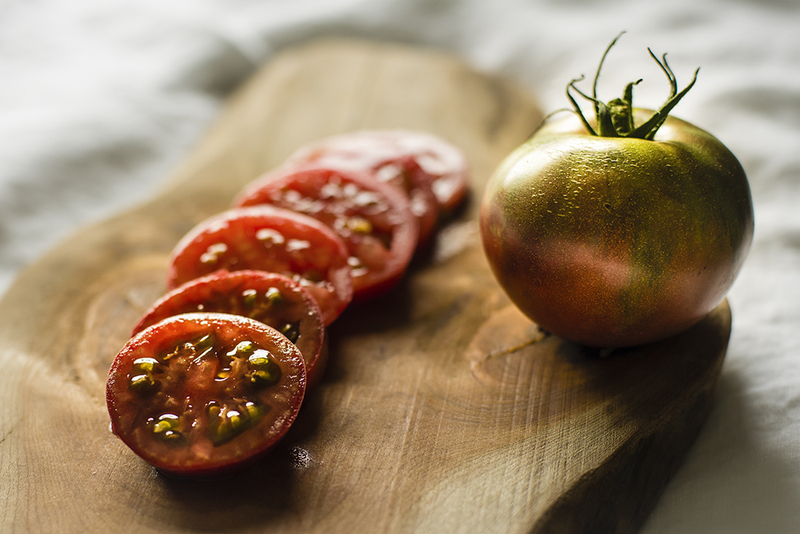 – We’ve enjoyed lots of “local” tomatoes from farmers markets this year. The one my mom grew only produced about 3 tomatoes, we’re not sure why. We prefer fresh over store tomatoes any day. – Love you photo. What variety is that tomato? I was thinking very pleasant thoughts about you guys when I ate one of your tomatoes with dinner last night! Thanks for packing the care package for me to bring home. Gorgeous shot and terrific quote, Sherry.